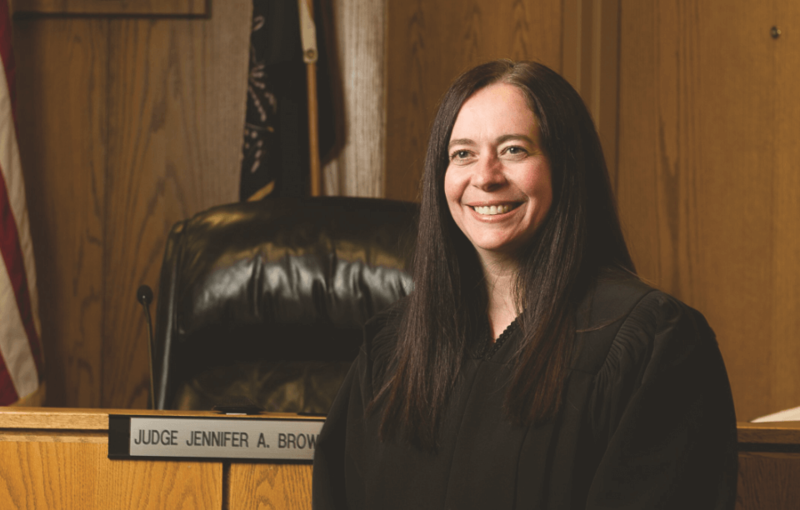 Judge Jennifer Brown was appointed to the Fourth District bench by Gov. Gary Herbert in December 2014. She took the bench in February 2015. She was assigned to the Nephi, Fillmore and Provo courthouses. We sat down with her to discuss her career and her advice to our readers. Brown: Throughout the course of my legal career, I would occasionally consider applying for a judicial position, sometimes prompted by a particularly positive (or negative) experience with a judge before whom I had appeared. I hoped that I would be able to serve in that position in a manner that would leave people feeling as though they had been treated fairly, regardless of the ultimate outcome of their case. As far as the timing of my appointment, I viewed my application as the first step in a long process because it generally takes multiple applications before being appointed. Needless to say, I was pleasantly surprised when I received the call from Gov. Herbert. Leaving my practice behind was hard, but the process itself was made easier because I was able to transition my clients and cases to current and former colleagues and I was confident they would be well-represented. Brown: The nomination process is long and nerve-wracking, but I found many sitting judges to be helpful in sharing their experiences. The effect that the process will have on you is difficult to understand unless you have experienced it, and talking with judges to understand how they handled their own appointments and the transition to the bench helped me. One thing I thought I understood, but didn’t fully appreciate until I experienced it myself, was that being a judge can be somewhat isolating. 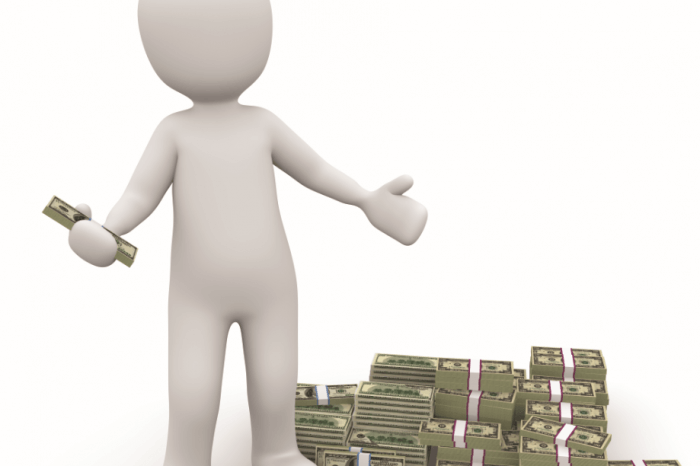 You should consider the impact on your personal life as well as your professional practice. 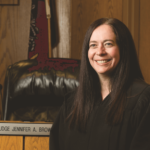 Brown: First of all, I try to approach every case with the level of care and preparation that I always hoped my clients would receive from our assigned judge when I was in practice. The parties appearing in front of me have spent a great deal of time, cost and energy on their cases, and deserve to have someone who has taken the time to understand the issues, and is ready to address their claims. Once we are in the courtroom, I generally allow counsel to present their cases with minimal interruptions, at least initially. I will follow up with questions if their presentation hasn’t fully addressed questions or issues that I have identified during my preparation. Brown: I consider my staff to be critical members of my team. My path to the bench was a bit circuitous, and I started my legal career as a legal secretary and then a paralegal before going on to law school. When I was working as a staff member, I always appreciated attorneys who treated me with respect, and I hope I have consistently demonstrated the same respect for people who work with me. My staff is critical to an efficient operation of my calendars, especially since I cover multiple locations. They do an incredible job of coordinating with one another, and making sure things run smoothly even when I’m not there in person. Brown: First of all, I take the Rules of Professionalism and Civility seriously, both in and out of the courtroom, and I always appreciate it when counsel is able to be a zealous advocate for their client, yet maintain the level of professionalism that reflects well on members of the bar. I also appreciate when counsel have worked cooperatively, to the extent possible, to reach agreement on as many exhibits or issues as possible before getting to trial so we can spend our time in the courtroom on the actual issues in dispute. Brown: I hope that I never become immune to the amount of stress, trauma, and other emotions that accompany many court proceedings because I always try to be conscious that the cases in front of me involve real people. However, it can be a difficult weight to carry when you are placed in the role of making the final decision. Brown: I really enjoyed the interaction that I had with my clients, and the ability to represent them in situations where they needed counsel, guidance and strong representation. Many of them were clients for years (some since the very beginning of my legal career), and I was able to work with them through a wide variety of circumstances and events. I miss the relationships we were able to develop and the role I played in their lives and businesses. Brown: Although I am officially an empty- nester, I still spend a great deal of time with my children and participating in their activities. They are each adventurous and independent, and are making their way into the world. Over the past year, in order to spend time with them where they happened to be at the time, I have made trips to Italy and Germany. We love to travel and have seen many amazing places together, but I’m looking forward to having them all gather back at home this summer. Brown: One of the few unfortunate things about being a judge is that your public role changes significantly. Prior to being appointed, I was heavily involved in the scholarship program offered by the Wasatch Community Foundation, a nonprofit organization located in Wasatch County, but I resigned from that position upon taking the bench because it involved fundraising. I enjoy teaching, and take opportunities to speak to school classes and scouting troops when my schedule allows. Brown: I cannot adequately express how fortunate I have been in my legal career to work with, and be mentored by, incredible attorneys and human beings. I’m hesitant to start listing names, because I would almost certainly omit someone. I am a better writer and legal thinker because I learned from some of the very best attorneys in Utah who were willing to give me opportunities to grow, and to invest their time and effort in sharing their wisdom and experience. I’m happy to say that my good fortune has continued with the warm welcome I have received from my colleagues in the Fourth District. I very much appreciate how helpful they have been since I was appointed to the bench. Brown: I am currently learning to speak Spanish. I took classes in high school, but would very much like to become fluent. I use some of my travel time to work on my lessons.